Rashid Khalidi: From Iran to Palestine, Nikki Haley Put a Nice Face on Trump’s “Horrific” U.S. Policies | Democracy Now! Edward Said professor of Arab studies at Columbia University. He is the author of several books, including Brokers of Deceit: How the U.S. Has Undermined Peace in the Middle East. His next book, The Hundred Years’ War on Palestine, will be out in May. U.S. Ambassador to the United Nations Nikki Haley has announced she is resigning her post at the end of the year. The former South Carolina governor—one of the few women in Trump’s Cabinet—gave no reason for her departure. During Nikki Haley’s time as U.S. ambassador to the United Nations, the United States withdrew from the Paris climate accord; the U.N. Human Rights Council; the Iran nuclear deal; UNRWA, the U.N. agency that provides humanitarian aid to Palestinians; and UNESCO, the U.N. educational and cultural agency. We speak with Rashid Khalidi, Edward Said professor of Arab studies at Columbia University, about the significance of Haley’s departure and the role of the United States at the United Nations. Khalidi is the author of “Brokers of Deceit: How the U.S. Has Undermined Peace in the Middle East.” His next book, titled “The Hundred Years’ War on Palestine,” will be out in May. AMY GOODMAN: Nikki Haley, the U.S. ambassador to the United Nations, has announced she is resigning her post at the end of the year. The former South Carolina governor was one of the few women in Trump’s Cabinet. She gave no reason for her departure. Haley made the surprise announcement at the White House Tuesday alongside President Trump. During her remarks, she praised the president for pulling out of the Iran nuclear deal and for being a close ally to Israel. NIKKI HALEY: But I’m most excited—look at the two years. Look at what has happened in two years with the United States on foreign policy. Now the United States is respected. Countries may not like what we do, but they respect what we do. They know that if we say we’re going to do something, we follow it through. And the president proved that, whether it was with the chemical weapons in Syria; whether it’s with NATO, saying that other countries have to pay their share; I mean, whether it’s the trade deals, which have been amazing. They get that the president means business, and they follow through with that. But then, if you look at just these two years at the U.N., we cut $1.3 billion in the U.N.'s budget. We have made it stronger. We've made it more efficient. South Sudan, we got an arms embargo, which was a long time coming. Three North Korean sanctions packages, which were the largest in a generation, done in a way that we could really work towards denuclearizing North Korea. The Iran deal, bringing attention to the world that every country needs to understand you can’t overlook all of the bad things they’re doing; you have to see them for the threat that they are. I think you look at the anti-Israel bias and the strength and courage that the president showed in moving the embassy and showing the rest of the world we will put our embassy where we want to put our embassy. AMY GOODMAN: During Nikki Haley’s time as U.S. ambassador to the United Nations, the United States withdrew from the Paris climate accord; the U.N. Human Rights Council; the Iran nuclear deal; UNRWA, the U.N. agency that provides humanitarian aid to Palestinians; and UNESCO, the U.N. educational and cultural agency. The Trump administration also threatened to sanction judges on the International Criminal Court if it went after Israel or the United States for war crimes. And the U.S. refused to sign the global compact on migration, a set of nonbinding rules for safe, orderly and regular migration. While Nikki Haley did not say why she was resigning, she dismissed speculation she’ll be running for president in 2020. President Trump says he’ll name a replacement in the coming weeks. On Tuesday, he said his daughter Ivanka Trump would be incredible at the job. Ivanka Trump later tweeted that she would not be replacing Haley. The person who does replace her will have to go before a Senate confirmation. Donald Trump also said one possible candidate is Dina Powell, an Egyptian-born Goldman Sachs executive and Trump’s former deputy national security adviser. Powell is said to be close to the president, as well as his daughter Ivanka and her husband Jared Kushner. While at the White House, Powell focused in part on U.S. relations with Israel and Saudi Arabia. She attended President Trump’s first meeting with the crown prince of Saudi Arabia, Mohammed bin Salman. NBC reports she was also involved with overseeing a $200 billion arms deal between the U.S. and Saudi Arabia. To talk about the significance of Nikki Haley’s departure and the role of the United States at the United Nations, we’re joined now by Rashid Khalidi, the Edward Said professor of Arab studies at Columbia University, author of several books, his most recent, Brokers of Deceit: How the U.S. Has Undermined Peace in the Middle East. His next book, titled The Hundred Years’ War on Palestine, will be out in May. Professor, welcome back to Democracy Now! RASHID KHALIDI: Thank you, Amy. AMY GOODMAN: Your first response? Was this a shock to you, like to so many others? RASHID KHALIDI: It was a surprise, because she put such a nice face, an articulate face, on a policy that is horrific in many respects, vis-à-vis Palestine, vis-à-vis Iran, on so many fronts. What she was putting forward, while perhaps red meat to the president’s base, is probably abhorrent to most Americans and has, contrary to what she said, made the United States much more isolated internationally. AMY GOODMAN: It’s also interesting, the timing. I mean, she just said—I mean, they were saying that they didn’t want to look like after the midterm elections, but they say that last week the resignation letter was put in, which was right after Judge Kavanaugh, at the time, testified and during the FBI supposed investigation. So, to say the least, there was a lot of tension within the Trump administration around this. She didn’t say anything about this at the time, but, of course, if she ran in the future, she could refer back to the period of time that she actually resigned. RASHID KHALIDI: Right, and she distanced herself from the president during the campaign by saying any allegations by women should be heard and should be investigated. So, she’s a very ambitious woman. If she’s planning a run, should Trump not run again in 2020, or in 2024, this sets her up perfectly. I mean, it fits perfectly—the ambitious, calculating nature that she’s already shown at the U.N. and in South Carolina. AMY GOODMAN: I wanted to go back to what Nikki Haley said, sitting next to President Trump in the White House, about her relationship with both Trump’s daughter Ivanka and son-in-law Jared Kushner. During the news conference, she singled them out for praise. NIKKI HALEY: Jared is such a hidden genius that no one understands—I mean, to redo the NAFTA deal the way he did. What I’ve done, working with him on the Middle East peace plan, it is so unbelievably well done. And Ivanka has been just a great friend. And they do a lot of things behind the scenes that I wish more people knew about, because we’re a better country because they’re in this administration. AMY GOODMAN: That was Nikki Haley, again, speaking in the Oval Office next to President Trump, talking about Jared Kushner. This is your expertise. You’re a Palestinian-American professor. You’re the Edward Said professor at Columbia University. Talk about Jared Kushner and what she described as his remarkable or incredible role in dealing with the Middle East. RASHID KHALIDI: Well, you would only consider it remarkable if you think that denying that the Palestinians have a role, that the Palestinian refugees should return or have any rights, that UNRWA is a good thing, that Jerusalem is a capital and should be a capital for Palestine. The policies that she has put forward and advocated so effectively and articulately are policies that are abhorrent to most of the world, most of the Arab world. Many Israelis realize that this is leading them down the path to a situation where no compromise is possible, where Israel becomes the sole ruler of everything. And Trump seems to be very content with this: The Palestinians should accept whatever place is offered to them in this process. And that is what Kushner has been doing systematically, on Jerusalem, on refugees, on the idea of a Palestinian state. They have dismantled all the elements of what I have always considered—a very bad American policy has become much worse, thanks to her. So, Jared Kushner is a genius if you believe that Israel has won and can impose any terms it wants on the Palestinians, who should not have sovereignty, self-determination or statehood. If you believe that, then it’s a wonderful policy. AMY GOODMAN: On May 14th, the Israeli military massacred at least 61 unarmed Palestinians, wounded, in this one day, 2,700 more, for protesting in Gaza against the Israeli occupation and the opening of the new U.S. Embassy in Jerusalem. At the United Nations, U.S. Ambassador Nikki Haley blocked a call for an international investigation into Israel’s actions. NIKKI HALEY: I ask my colleagues here in the Security Council: Who among us would accept this type of activity on your border? No one would. No country in this chamber would act with more restraint than Israel has. AMY GOODMAN: Since March 30th, the beginning of the right-of-return campaign protests, Israeli soldiers and snipers have killed at least in the area of 195 Palestinians, wounded more than 18,000. Your comments on what she performed at the United Nations? 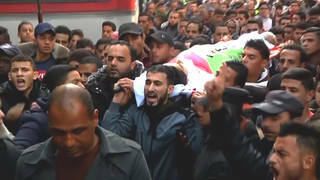 RASHID KHALIDI: No country on Earth that shot thousands of people on the other side of its border, in a situation in which none of its own citizens were hurt—one Israeli soldier actually was killed, but with that exception—would be free of condemnation in the United Nations. Imagine if the United States shot down hundreds of Mexicans, killed 200 and wounded or maimed thousands across the border, inside Mexico, in the sovereign territory of another country. It would be completely unacceptable. The Palestinians clearly don’t have rights. They can be—the victim can be vilified by people like Nikki Haley. It’s revolting. The very description of the Palestinians as the aggressors and the Israelis as the victim—Israeli snipers are targeting these people one by one, and the Israelis are being defended by Nikki Haley at the United Nations. AMY GOODMAN: Just before the U.N. General Assembly denounced Washington’s decision to move its embassy in Israel to Jerusalem, U.S. Ambassador Haley tweeted a warning to other nations. She wrote, quote, “At the UN we’re always asked to do more & give more. So, when we make a decision, at the will of the American ppl, abt where to locate OUR embassy, we don’t expect those we’ve helped to target us. On Thurs there’ll be a vote criticizing our choice. The US will be taking names,” the ambassador famously said. Professor Khalidi? RASHID KHALIDI: Yeah. I mean, this is the most vibrant expression of American exceptionalism I’ve ever heard. The United States is not bound by laws. The United States is not bound by conventions. The United States does exactly as it pleases. The issue of Jerusalem is a complicated legal issue, but it’s not that complicated. Everything the United States has done has shredded seven decades—in fact, a little more—of international consensus as far as the treatment of Jerusalem. And they don’t care. The United States under Trump—the United States has always done more or less as it pleased, but at least it paid lip service to law and international legitimacy. Not under this administration. AMY GOODMAN: Outgoing U.S. Ambassador to the United Nations Nikki Haley has, to say the least, been, whatever is happening behind the scenes, in lockstep with the administration. She announced in June that the United States was withdrawing from the U.N. Human Rights Council, accusing the council of being biased against Israel. NIKKI HALEY: For too long, the Human Rights Council has been a protector of human rights abusers and a cesspool of political bias. Regrettably, it is now clear that our call for reform was not heeded. AMY GOODMAN: The significance of this? RASHID KHALIDI: Well, yet again, the United States is proclaiming that only its views count. The views of the entire world on these issues are simply irrelevant, as far as this administration is concerned. The United States has run interference for Israel, protecting it in the United Nations, for decades now, and I expect that to continue, irrespective of whether Trump stays on after 2020, unfortunately. But this is the most egregious example of this I’ve ever seen. AMY GOODMAN: I want to go back to John Bolton, because he’s the powerhouse there now. Last month, the national security adviser announced the Trump administration would close the Palestine Liberation Organization’s mission in Washington in response to a Palestinian effort to push the ICC, the International Criminal Court, to investigate Israel for war crimes. This is Bolton making the announcement in a speech at the Federalist Society. JOHN BOLTON: The Trump administration will not keep the office open, when the Palestinians refuse to take steps to start direct and meaningful negotiations with Israel. The United States supports a direct and robust peace process, and we will not allow the ICC or any other organization to constrain Israel’s right to self-defense. AMY GOODMAN: So, that’s John Bolton, not Nikki Haley, but she has supported this. And today is the day? RASHID KHALIDI: I believe so. AMY GOODMAN: That the mission is going to be closed in Washington? RASHID KHALIDI: I believe the mission is finally closed today. RASHID KHALIDI: Well, it’s, once again, a diminution of the idea that the Palestinians can speak for themselves, permission to narrate, that they can have a voice in Washington, that they can—that they are a party to this conflict. In fact, they’re the main party to this conflict. And what the United States and Israel have been doing is to sideline them, weaken them, divide them and essentially try to dictate terms. And this is part of a whole process that this administration has taken to a new level, of knocking out the pillars that had formerly been assumed to be absolutely essential for any approach to peace in Palestine—refugees, Jerusalem, recognition of Palestinian self-determination. AMY GOODMAN: Let’s talk about refugees. The Trump administration said in September it would end all U.S. funding for UNRWA, the U.N. agency that provides humanitarian aid to Palestinians. The move was seen as an effort to undermine Palestinians’ right to return to the lands they were displaced from by Israeli settlers. This is chief Palestinian negotiator Saeb Erekat. SAEB EREKAT: So now this is an American political decision, added to their decision to recognize Jerusalem as Israel’s capital, move the embassy, consider the settlements legal, refuse the two-state solution of '67. So, actually, this is the program and the agenda of Sheldon Adelson and Benjamin Netanyahu. The United States may have the right to say, “We don't want to give taxpayers’ money.” But who gave the U.S. the right to approve the stealing of my land, my future, my aspiration, my capital, my Aqsa Mosque, my Holy Sepulchre Church? They have no right whatsoever. AMY GOODMAN: The ending of UNRWA funding. I think the U.S. was something like $350 million, but a third, for this U.N. agency that helps Palestinians. What does this mean for Palestinians? RASHID KHALIDI: Well, it’s going to mean further immiseration of a population that in many places, like the Gaza Strip, are at the point of a humanitarian crisis or are in a humanitarian crisis. But what it is is a part of what this unrecognized genius—in Nikki Haley’s words—Jared Kushner is pushing, which is to say there are no Palestinian refugees. This is a false problem created by the Arab states to embarrass Israel, that three generations on, they should be forced to stay in the countries to which they were expelled by ethnic cleansing in 1948, and the problem is settled. It’s been solved. Israel kicked them out, and they must not ever be allowed to return. So, this is, again, kicking out a pillar of a settlement, making, in fact, peace much, much more difficult. If the United States doesn’t recognize that there are Palestinian refugees—if it tries to impose on Palestinians in Jordan, for example, because they have Jordanian nationality, they are therefore Jordanians, not Palestinians, not refugees—then you’re denying one of the major issues that’s bedeviled the world for 70-odd years. AMY GOODMAN: I want to ask you about Lara Alqasem, the 22-year-old student at the University of Florida who’s been detained in an Israeli airport for more than a week for supporting a pro-Palestinian boycott campaign. She arrived at Ben Gurion Airport last week with plans to enroll at an Israeli university, and has been held there since, while she appeals a deportation order. On Tuesday, the Israeli government told her to apologize and renounce her support for BDS or return to the United States. Professor Khalidi, what about Lara? RASHID KHALIDI: Well, the thought police are at work here. And this is part of an effort to repress speech in this country, in Europe, in Israel, around this issue, around the issue of Israel’s violations of Palestinian rights generally, and specific issues like occupation or refugee return. And the person who’s making the statements in Israel, actually a very important character by the name of Gilad Erdan, who is the minister of strategic affairs, is in fact one of the central people in this worldwide campaign. We see an element of it in turning back people at Ben Gurion Airport—not just activists, Palestinian-American activists; American Jewish leaders, people who are being detained, harassed, in some cases turned back—Katherine Franke of the Center for Constitutional Rights and many others. AMY GOODMAN: Leading law professor at Columbia University. RASHID KHALIDI: One of my colleagues at Columbia, precisely. And in this country, the same centralized apparatus is harassing students on campus, bringing lawsuits of absolutely no merit again and again and again, spending hundreds of millions of dollars, it seems to me, on a campaign worldwide—in Britain, in Germany, in this country—to essentially shut down discourse on Palestine. “You can’t talk about that,” they’re saying. AMY GOODMAN: What needs to happen? And does it matter who is the U.S. ambassador to the United Nations under President Trump? RASHID KHALIDI: It probably matters, but this administration’s policies aren’t going to change if a less or more articulate representative of nauseating and horrific policies is installed in that seat. I mean, the American government’s policies on Iran are causing enormous suffering inside Iran. American policies on Palestine are causing enormous suffering in places like Gaza. Schools will shut down. Children will go without education. Those are awful policies, guided by a sense that the only evil in the Middle East is Iran and its clients and allies—people, for example, like Hamas, who rule the Gaza Strip—ignoring the enormities perpetrated by U.S. allies, like, for example, the Saudi Arabian regime, which is making war on Yemen, creating a humanitarian crisis in Yemen, and at the same time, apparently, liquidating dissidents, prominent dissidents.